The Cloud Edition comes as a full version, but you only make small subscription payments. This ensures that you always work with the latest technology available. Since all plans are billed on a monthly or yearly basis, you may cancel at any time and will never be charged again. In case of increasing requirements, you may just switch to another Licence Protector version. Lifetime license means, that the license never expires. Service packs are free (version number changes e.g. from 6.0 to 6.1) but updates to a new main release (version number changes e.g. from 6 to 7) are not included. 30 days support by e-mail is included. The lifetime license and on-premise Activation server is licensed via the Perpetual End User License Agreement. It includes additionally the online activation package S1 with 100 transactions per month and access to the Activation Server which is the central point for administration of licenses - create keys, lock licenses, change activations or generate reports. Mirage offers the online activation as a service. To use this service, you need to buy a license of the Starter, Basic, Professional, MAC Edition or Cloud Edition. 100 online transactions are already included in the service subscription. The price is a price per month and is charged 3 months in advance. You start with the package you think that will fit. To ensure that activations are not blocked, the subscription is automatically adjusted to the next appropriate hosting package when the maximum number of transactions is reached. The service can be terminated to the end of the base period. 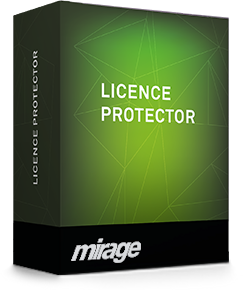 The Licence Protector Enterprise Suite is a bundle of several Licence Protector products.